February 20, 2018 from Paramount Home Media Distribution. The film arrives on Digital February 6, 2018. Based on The New York Times best-selling book, and recipient of the Dove Foundation seal of approval for ages 12+,SAME KIND OF DIFFERENT AS MEfollows successful art dealer Ron Hall (Greg Kinnear, Heaven Is For Real) and his wife Debbie (Renée Zellweger, Bridget Jones’s Diary), who seemingly have the perfect life. 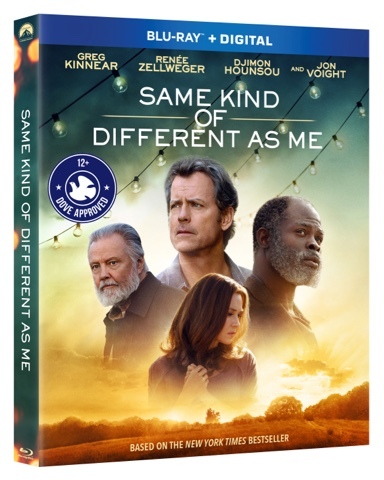 But when their faith and family are tested, an unlikely bond with a homeless drifter (Djimon Hounsou, Blood Diamond) leads them on a remarkable journey that forges an everlasting friendship. “Loaded with surprising twists and turns” (Jim Ferguson, KGUN9 ABC Tucson),SAME KIND OF DIFFERENT AS MEshows how a simple act of kindness can change everything.